I Think this Roster Makes sense..
RE: I Think this Roster Makes sense.. Rain has developed into a nice character, though I’d wish that they’d get away from the ninja inspired look all together. They should show Edenia too. He’s 100% in regardless of that interview. I dislike his name though, with a passion. Can never take that seriously.. I love his name, but i guess if English/American was my native language it would not sound that cool. I like Rains overall design in mkx (which stemmed from his Armageddon look) .. it’s not very ninja looking, more so royalty in my opinion. What is going to be interesting is that since Kitana looks Japanese I wonder if Rain will also look Japanese. The Edenian look to this point has always been darker skinned but more middle eastern?? Idk. But should be interesting to see his style in mk11 if he gets in. Back in Armageddon I remember seeing a BTS of some sort (don't remember if it was a video, concept art or what) talking about how they were interpreting Edenia as having an Ancient Greek flavor, which was the inspiration for Edenian architecture and the designs for Taven and Daegon. Greek and Near Eastern aesthetics are pretty closely linked, so the fact that they've hovered in that general geographic neighborhood for Edenian designs afterward makes sense. Kitana's always been an odd one out though, because her name and her roots in MK2 strongly point in an East Asian direction and it's really hard to let go of that. (Sindel doesn't seem to fit either region; I always thought her design was more inspired by Bride of Frankenstein than anything.) So I guess the takeaway is that Edenia is dominantly Greek/Near Eastern-ish, but there are other kinds of cultures around as well because Edenia is an entire planet. How cool does it sound in your native language, @SenSx ? As far as MK's habit of naming characters after things goes, I've long felt sorry for Reptile and C/Khameleon because their names are clearly racial slurs given to them by their slave masters. It was pretty awesome seeing the developers kind of acknowledge this when Raiden reveals his real name as Syzoth. Noob doesn't do so well either, for reasons that are obvious now but couldn't have been anticipated back when he was created. I know this sounds super racist, but it isn't, Rain has never been Asian, so why suddenly turn everybody asian? I love characters like Kung Lao and Liu Kang, they are Asians and I love that, but the Edenian super pretty characters shouldn't be all Asian all suddenly. Kitana has always had more of an Asian influence than the other Edenians. She has a Japanese sounding name and carries Japanese tessen fans. It makes sense for her to appear more Japanese. Doesn't mean anyone else will also change. As for vanity as a character trait, what about Kung Lao? Kung Lao = Envy, not vanity, he doesn't care about his appearance. Johnny and Rain are the only vain characters, maybe Tanya, dunno. From the moment they gave him any personality at all, Rain has been defined by personal pride. Pride in his appearance is a symptom of his vanity, not the core of it, just like Johnny Cage. And it's the same kind of arrogance and the need to "be somebody" that Raiden chastises Kung Lao for in MK9. I really appreciate how much more authentic Liu Kang and Sub-Zero look now. White Dude Sub-Zero has bugged me since MK3. I loved white dude Sub-Zero, and because Sub-Zero was supposed to be HALF Asian only. I think Scorpion was the one that was fully Asian. This new look for Sub-Zero looks horrible, really ugly. I loved his look in MKX. I and nearly every other half-Asian person I know looks more Asian than white. Asian phenotype tends to dominate. I will try not to take your comment about Sub-Zero's face, which is modeled from a real Asian human's face, as looking horrible and ugly, too personally. I gotta tell you though... it's not easy. 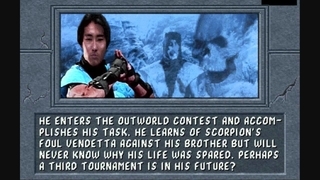 By the way, they only made Sub-Zero half white to explain away the fact that he was played by a (totally) white actor. He was originally conceived by Tobias to be Chinese. Look it up. It's an ingame sprite + my personal sexual preferences, nothing to do with racism at all, if I hated all Asians I wouldn't have cared so much for Kung Lao, Liu Kang, Scorpion, and especially Shang Tsung and Sektor, two of my favorite characters of all times. I just don't like Kitana and Sub-Zero to be fully Asian-looking, as I am used to their previous appearances. And I find this sub-zero to be much uglier design in general to MKX's design. You're free to enjoy your aesthetic preference for a white Sub-Zero, but I'm personally happier with a version that's both truer to the original concept and a bit more accurate for a mixed heritage guy. I think I tend to prefer a Sub-Zero who looks Caucasian this day in age just because I've become used to it over the past 15-20 years... He looked white in MK3, fairly white in MK4, Old Man white in MKDA, SUPER white in Deception (that one was a joke, we couldn't see his face in Deception, but his skin was very pale), AND fairly white again in MKX. So making him suddenly look Asian again seems off after all that time. THAT SAID... yeah, I've been aware of that MK2 ending screen for that entire time too, and fully acknowledge he originally looked Chinese. So to make him look Chinese again is not entirely out of left field. I think I tend to prefer a Sub-Zero who looks Caucasian this day in age just because I've become used to it over the past 15-20 years... He looked white in MK3, fairly white in MK4, Old Man white in MKDA, SUPER white in Deception (that one was a joke, we couldn't see his face in Deception, but his skin was very pale), AND fairly while again in MKX. So making him suddenly look Asian again seems off after all that time. I understand that perspective. I just fall closer to the "just because it's normal doesn't make it okay, or not worth fixing" span of the opinion spectrum.